A part-time serving job is by far one of the most sought after and attractive jobs for people looking to make quick money. Naturally, they're all after one thing: tips. 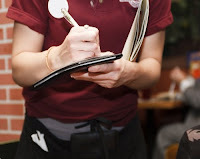 People who work at nice restaurants and are exceptional at providing good guest service can easily turn their occupation into a permanent livelihood. Wait staff get to take home money on a daily basis and still receive a paycheck. The hospitality industry, however, is usually fast-paced so servers need to be quick on their feet, able to memorize the menu, and have a great deal of patience. It isn't for everyone, but those that can handle it well can find serving as a suitable career move. Many landscapers are self-employed so the only boss they have to report to are themselves. They can also end up making more money being self-employed as opposed to for another employer. Keep in mind that landscaping also doesn't have to be limited to seasons or regions. Landscaping may be needed for all kinds of work whether it be on grass or snow. Social media is making waves in all industries from entertainment to politics. These jobs can easily be done through telecommunications so many companies will hire part-timers to do the work remotely. Companies are looking for the extra set of hands without having to take on another full-time employee. These types of jobs are suitable for freelancers and people wanting to fatten up their wallets a bit. Part time social media specialists can earn an hourly rate from $20-$50 depending on their experience and web-savviness. There are no shortages of capable people for the job and it requires no formal education so it's best to get into it if you want somethinig to add to an existing main source of income. When companies are down-sizing, the addition of part-time jobs are what's keeping the economy from collapsing entirely. Part-time workers benefit both the employer and employee. The employer can cut back on the addtional costs of compensating a full-time employee (like benefits and salaries) and the employee can rest easier knowing that they can expect the number in their bank accounts to always stay on the plus side. There are plenty of part-time jobs out there, usually more than full-time, that are easy to get. Whatever the circumstance, if you've got money problems, a part-time job may be the right remedy.